I’m roughly two weeks away from working entirely for myself. My only remaining job where I work for an employer is relatively hands-off as the company is based on the west coast, so I’ve been effectively working for myself for a couple months now. I don’t know that I ever pictured my life where it is today; in fact, I imagined at this point in my life I would be practicing pharmacy for virtually the rest of my life. To think that I was a person capable of owning a business would have been laughable to me. I was an overachiever in school but effectively an underachiever in life as I didn’t strive for much more than a job I found interesting, paid enough to live, and I wouldn’t have to change. I will say that I’m extremely happy with where things have ended up, despite the rocky road to get here. There’s the saying that the grass is always greener on the other side, however, and some days I find myself frustrated or stressed and think about what it would be like to have a regular, steady job like the one I envisioned myself in. It’s as much for me as it is you, and I hope that in listing out some of these things, both you and I can get a better perspective. As with anything in life, I find it easier to think of cons before I can think of pros in a situation. Even when I sit for longer and rack my brain, my con list is still usually longer than my pro. In this case, however, I think the fewer number of pros weigh heavier than the longer number of cons. I value flexibility and creative freedom far more than dealing with the cons that are on this list. I make my schedule. It’s amazing. I schedule clients when it’s convenient for both of us and I make sure that it doesn’t interfere with the time I need to commit to this blog and other freelance projects. I make it sound like I’ve always done that, but it’s taken a ton of looong days and trial and error to figure out when those times are so that I can keep my sanity. I’m able to be home to walk the dog several times during the day, can make time for certain events or invites, and make doctors appointments without asking for permission to take off work. I know I need my weekends to relax, so I made it a rule not to train people on Saturday or Sunday. I taught classes for a long time on the weekends, and it’s really nice to have them completely free. I’m not sure if this is a good quality or not, but I’ve often butted heads with past bosses because I’ve felt that the decisions they made were damaging or unnecessary. I had a hard time doing things I felt were detrimental or if I found myself in a work environment that I felt was toxic. I’m a very efficient worker, so when I’m given a task I complete it quickly. At previous jobs, this left me with a lot of downtime. I wasn’t able to use my phone or do anything non work-related during business hours, and I felt like I was wasting both mine and the company’s time. Now, when I have a productive day and finish my work in less than 8 hours, I take the rest of the time off (or try to 🙂 ). It’s a business model that makes far more sense to me than forcing people to sit for 8 hours if the work can be done in 4. Working for myself means I don’t have to deal with any of that. I’m free to make whatever decisions I want for my businesses and don’t have to worry about someone else telling me no or clashing with them. This is one thing that I love more than anything. Ok, this is only for one of my businesses. Obviously I can’t take a month off and train people from another state or country, but I can write and work on social media projects anywhere there’s an internet connection. This also means I work from home a lot when I write, which I love as an introvert, but also requires time management skills which I’m still fine tuning as I get used to this process. 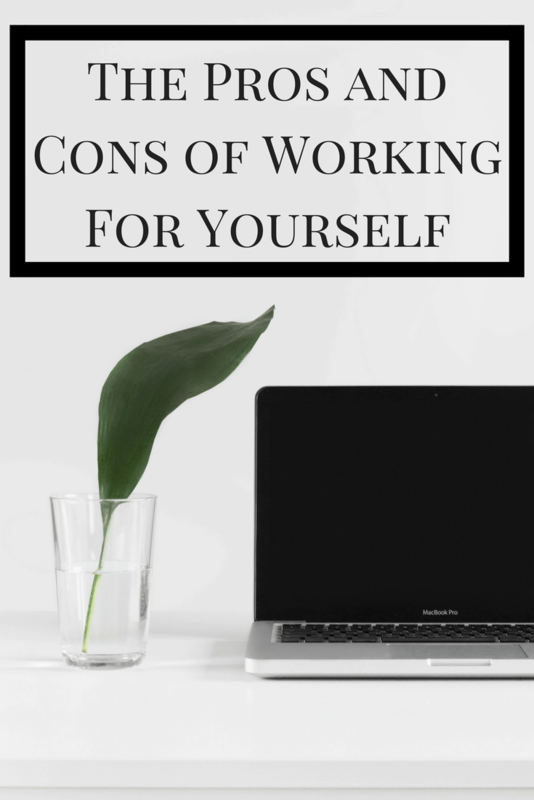 Before taking the leap, remember there are pros AND cons to working for yourself. Unless you can completely work from anywhere, there’s the risk of lost income. Since half of mine comes from personal training clients, taking an extended vacation means that I lose those days. I have to be careful about how much time I take off and if it’s going to be longer than normal, I plan for that in advance by seeing more clients in a shorter time frame or taking on more freelance work to get ahead. As a single person, working for yourself can prove a little more difficult on the insurance front. You have to provide your own, which often isn’t quite as good as one that an employer would provide for you. Luckily, I’m able to be on Neil’s insurance through his work, but I understand how this can be a frustration for those who are single and self-employed. Oh, taxes. I miss the days when I did my own 1040-EZ tax return on Turbo Tax in no time, sent it off, and received a refund. These days I have multiple sources of income and two corporations and don’t even know where to begin. I hired an accountant because I certainly know when to admit something is out of my league. I had so much fear around finances and taxes and hiring an accountant is one of the best decisions I made this year. Remember — outsource what you can so that you can focus on what you do well. I referred to this in the pro list, but effectively working from home requires excellent time management skills. This is something I’m still working on and learn the same way I learn a lot of lessons in life — through trial and error. One thing I’ve started to do is either turn my phone over so I can’t see the notifications or leaving it out of reach altogether. It’s so easy for me to start replying to texts, watching stories on Instagram, or any other number of things that detract from getting actual work done. I’ve heard of a ton of time management tips like the Pomodoro method, but I think I’m settling into a groove that works for me. I’m also stubborn and until I stress myself out I won’t actually try something new. When you work for yourself, it’s harder to see your own areas of weakness. There’s no one objective to give you a review or let you know where you may need to improve. Working for yourself requires a good sense of intuition and self-reflection in order to succeed. In order for your business to grow, you need to be able to adapt easily to change, think outside the box, and continually strive for ways to be better. Complacency will likely lead to stagnation, so you have to always be on your toes and looking for the next thing. Working for someone else means you likely do the job assigned to you for the betterment of the company, but the responsibility may not necessarily rest on your shoulders. Do you work for yourself? What are some of the pros and cons you have noticed? Let me know in the comments! I don’t work for myself, but I’m always tempted to. The pros of working for yourself always seem to sound so attractive! That being said, it’s important to weigh out the cons like you did as well. I don’t think that at this stage in my life, I’d be able to manage without a steady income from a full-time job. Perhaps when I have more experience! I definitely love the pros of working for yourself, but it’s true to weight the cons as well. I have definitely considered working for myself in the future. Not sure what I would do yet, but I would love the flexibility for when I have a family. I agree about your creative freedom point. I just started a new job 2 months ago and still have very little of my own work to do and seem to be more efficient than the last person in my position. I hate feeling like I am wasting time. I put google docs on my phone though and sometimes I write up a blog post while waiting for work to do because that feels more efficient to my time and then I can just edit it later. I don’t work for myself and while it sometimes sounds appealing, I do appreciate that predictibility of my workweek and a steady paycheck. Do you feel you’re able to do this because Neal has an employer (that can also provide insurance) or would you feel comfortable doing this on your own? Super insightful as always, Erin! My dream job would be working for myself but where I can be around people on a daily basis as well. I’m not totally sure yet what that will entail, but I’ve always known that traditional 9-5 just doesn’t work for me. Like you, I have the too much downtime problem or find myself antsy to do my own passion projects in the time that I should be working, simply because I don’t care about the work enough. Bad, I know, but I’m a very hardworking person so that really means something.I guess the only problem is it’s hard to launch into self-employment without much experience in the workforce and without a solid financial cushion to fall back on. All of them are SO VERY TRUE! I feel like time management would be tough for me.. but I think the pros are definitely something I’ll take into consideration as I’m thinking of working for myself in the future!